For over two hundred years, Fagerhult, a picturesque little town in southern Sweden, has been and continues to be home to the Bern family. In the nineteenth century, the family mastered the craft of clockmaking. One of their clocks was prominently located on top a tower in the town square, which necessitated the attending family member to climb the 157 steps for every winding of the mainspring. With sons apprenticing under fathers, all mastering this unique blend of science and art, Bern clockmakers became watchmakers as well. Charles Hyalmer Bern learned the watchmaking craft from his father but yearned to see, do, and achieve more than the prospects seemed to offer him in his native Sweden. Gathering his courage, tools, and savings he immigrated to the United States. In 1896, at the age of 24, he founded Chas. H. Bern, a watch sales and repair store in Chicago. With skill, perseverance, and luck, Charlie’s store flourished. 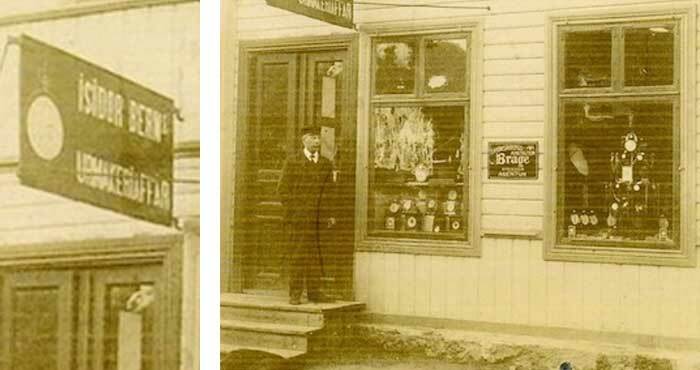 The store became a certified watch inspector to the railroad industry, eventually serving as inspector for 24 railroad lines. An important and coveted industry designation, this accreditation helped the store become a small chain when additional stores were established in the two largest Chicago railway stations. Chas. 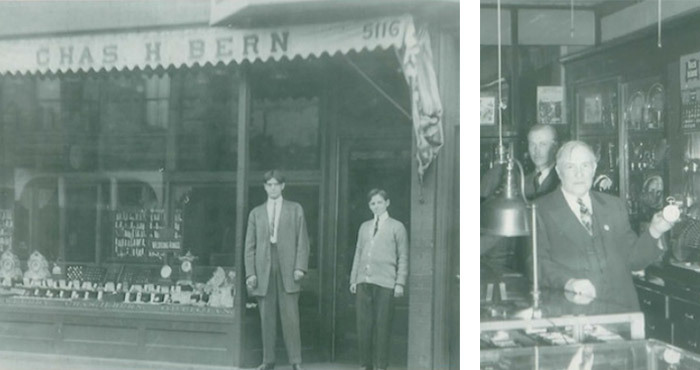 H. Bern remained in business until the late 1980s. 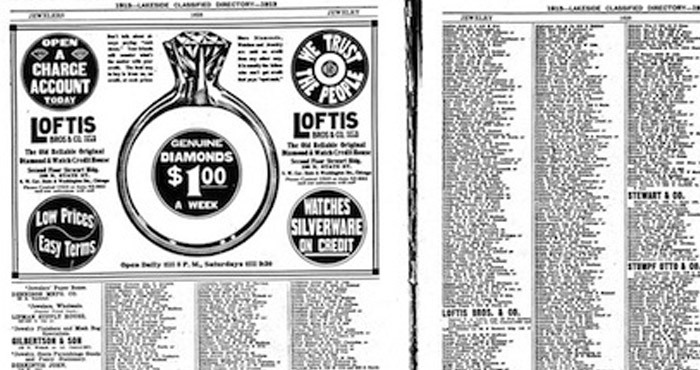 Both Charles and Ellis Bern are listed as local Chicago jewelers in this classified ad. Ellis Bern eventually left Chas H. Bern and worked out of his home until just prior to World War II, when he opened a small one-man watch repair shop on the south side of Chicago that he maintained until his retirement in the late 1950s. After living in Japan for a year following the conclusion of World War II, Jerry E. Bern, at the age of 26, joined Chas. H. Bern as a salesman. Working for Uncle Charlie was by no means an easy entry into the jewelry business. Charlie’s business survived the Depression because of parsimonious practices and ruthless Swedish practicality. Being Charlie’s nephew provided Jerry no apparent advantage. He was assigned to further develop the railroad employee clientele Chas. H. Bern had acquired as an official railroad watch inspector. Both Jerry and Mary Bern were aviation enthusiests. Jerry spent time in Hawaii as an Aircraft Mechanic during in the 1940’s. 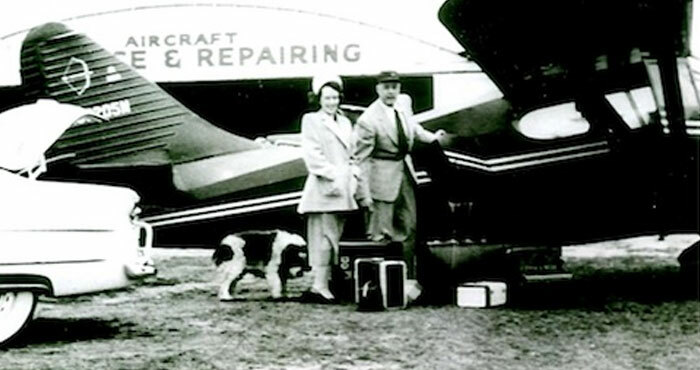 Mary flew DC-3s out of Midway in the 1950s – one of the first women to do so. After learning then honing sales and business skills during his 20-year tenure at Chas. H. Bern, Jerry E. Bern became sufficiently confident to undertake the biggest gamble of his life. 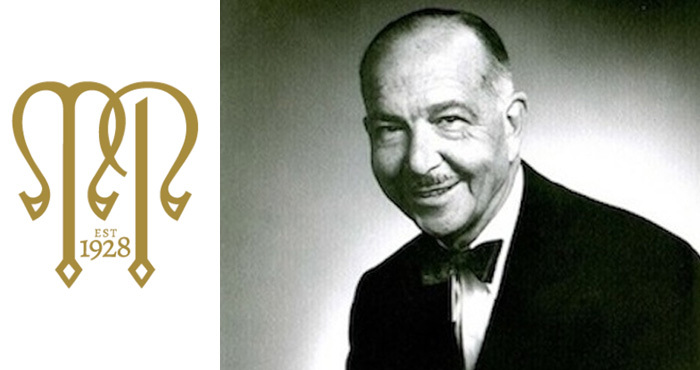 In 1967, with the support of friends and family, he purchased the well-established Chicago jewelry store, Marshall Pierce & Company. 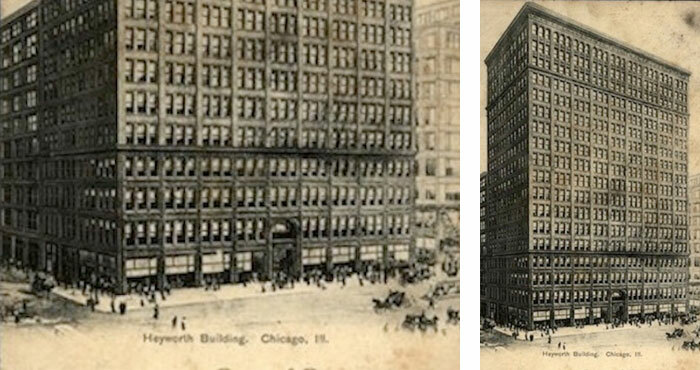 Like his father and uncle, the big Swede became a Chicago merchant and jeweler. Soon after acquiring Marshall Pierce & Company, Jerry E. Bern, Sr. embarked upon the upgrade and expansion of the merchandise and services offered by the firm. 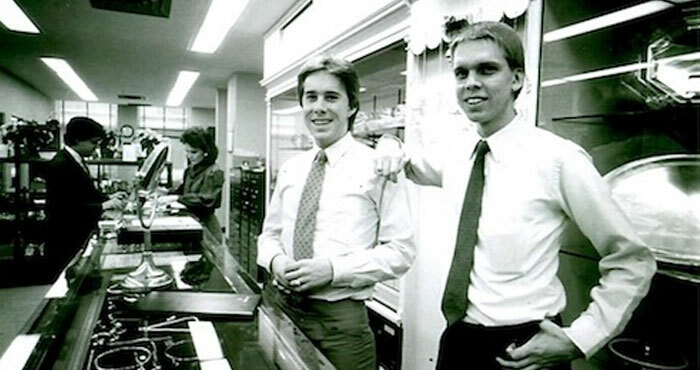 Jerry believed that the best merchandise, coupled with great service and irresistible pricing would fuel the store’s growth during the 1970s and beyond. He also instituted evolutionary organizational changes that continued to improve per employee sales figures and overall efficiencies. Over the thirty years that Jerry ran Marshall Pierce & Company, annual sales were bettered by each succeeding year. Again genetic predisposition, supported by the nurturing of a family business, yielded a new brood of jewelers. 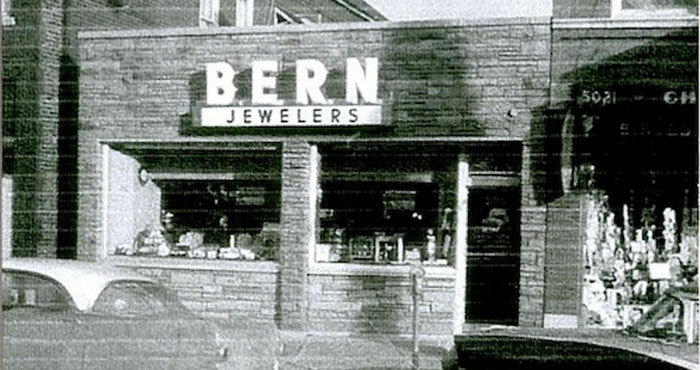 Two of Jerry’s three sons became the next generation of Bern jewelers. Jerry E. Bern, Jr. joined Marshall Pierce & Company full-time in 1978. James A. Bern similarly signed on to the firm in 1983. As with many modern family businesses, both men had worked for their father during summers and holidays from grade school through college. Jerry, Jr. and James also believed that their ideas and energy would help continue the growth of Marshall Pierce & Company’s customer base and product lines. In preparation for entering the family business, Jerry E. Bern, Jr., G.G. was educated at Western Illinois University then earned his Graduate Gemologist Degree in 1977 from the Gemological Institute of America. Jerry, Jr. is a nationally recognized authority on diamonds and colored stones and of the country’s jewelers and merchants, he is one of the most qualified. James A. Bern is a particularly knowledgeable horologist and was trained in aviation and economics at Southern Illinois University and in retail jewelry sales through his nearly life-long association with Marshall Pierce & Company. 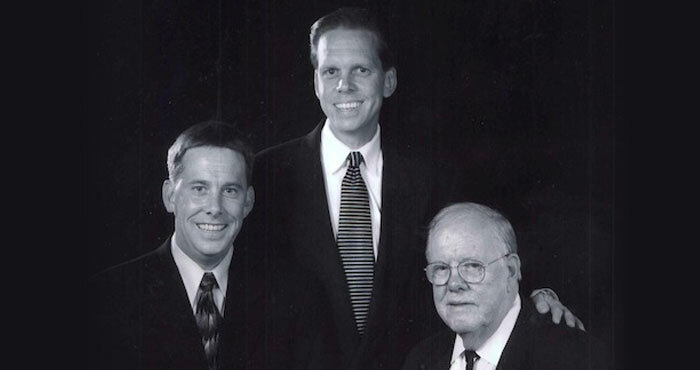 The 1980s saw the Marshall Pierce & Company expand its insurance, legal, trust, and corporate accounts as the younger Bern men successfully sought to develop those markets. Concurrently, responsibilities for day-to-day showroom operations were increasingly transferred to them as well. 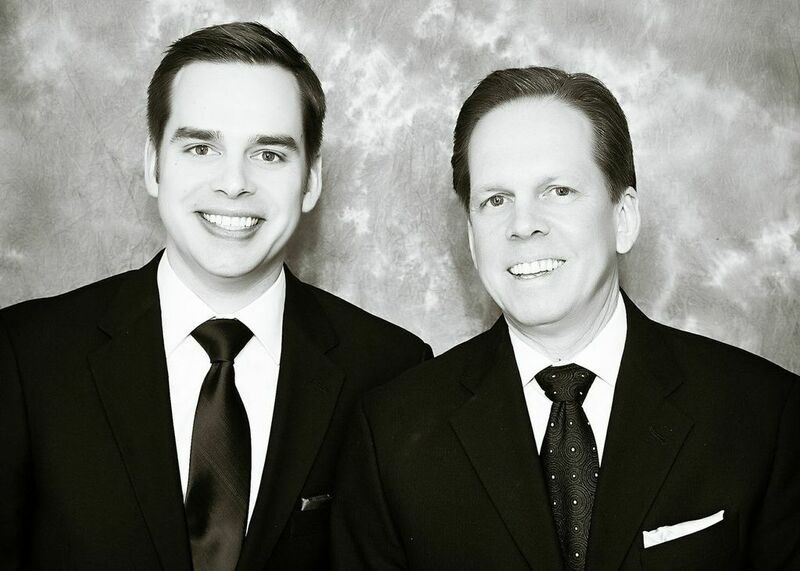 In 1991, Jerry E. Bern, affectionately and respectfully known within the Chicago jewelry community as the Boss, was promoted to Chairman Emeritus, and his sons, Jerry Jr. and James, became the owners of the company. In keeping with the Bern family’s focus on high-end watches and jewelry, in late 1998, Marshall Pierce & Company moved into its third showroom built within the classic 29 East Madison Building located in the middle of Chicago’s Jewelers Row. The store offers private rooms for consultations and a comfortable showroom, providing a refined environment in which customers and others may relax while visiting or making significant purchase decisions. 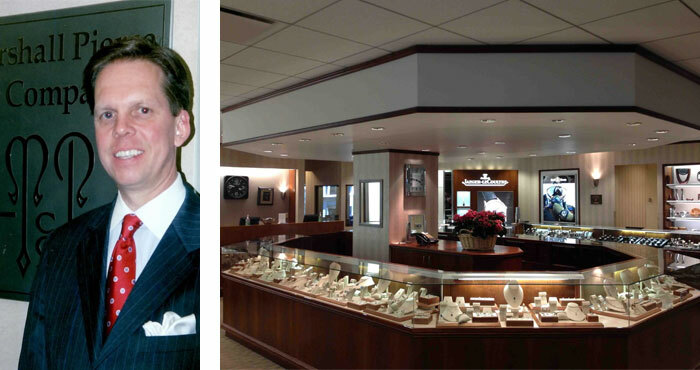 Under the leadership of the current generation of Bern jewelers, Marshall Pierce & Company continues adding world-class lines and products in its goal to exceed customers’ expectations. Since the turn of the 21st century, the prestigious nameplates Jaeger-LeCoultre, Oscar Heyman, JB Star, Tacori, A. Link, Baume et Mercier, Bell & Ross and Mont Blanc were added to the store’s large array of fine luxury lines. True to his roots, Evan Bern spent many summers and weekends at the family store while growing up. After achieving his undergrad degree from John Carroll University Evan pursued his Graduate Gemology Degree at the Gemological Institute of America. 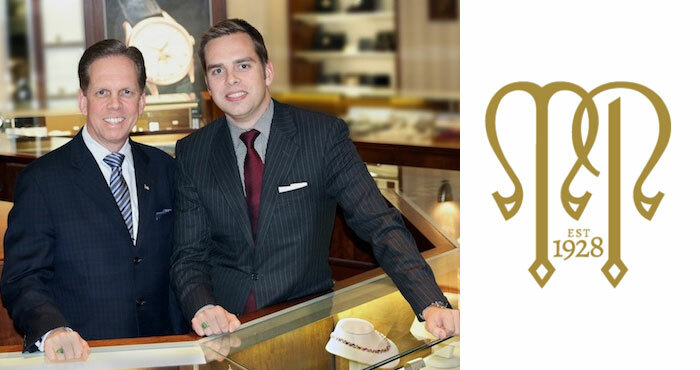 In late 2009, Evan joined the Marshall Pierce & Company team full time – a full 113 years after the first Bern watchmakers came to the United States. A Father & Son Shot to Start the New Year 2015 Will Be A Great Year for Marshall Pierce & Company! Marshall Pierce Moves to Michigan Ave Opening Day at 960 North Michigan Ave.